Starting from Munich, we reach Salzburg on the highway past lake Chiemsee within about one and a half hours. Upon our arrival at Salzburg city, we are greeted by our professional Salzburg tourguide who takes us on a guided city walk through the old town of Salzburg including a visit to the Mirabell Palace Gardens, a splendid panoramic view of Hohensalzburg Fortress, a guided tour to Salzburg Cathedral and a walking tour through the Getreidegasse street with the Mozart birthplace museum. After lunch in a traditional Salzburg restaurant, you can choose between a guided tour to the salt mines of Hallein, a ride on the summer tobbogan on Dürrnberg mountain, a falconery show on Hohenwerfen castle or the popular "Sound of Music" tour showing the original locations of the Sound of Music film and many fascinating scenerys and landscapes in the lake region east of Salzburg. For those who wish to do so, we can also include a ship cruise on lake Traunsee on the historical steamboat "Gisela". 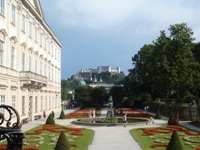 Comments regarding full day sightseeing tours to Salzburg: The website of Munich Tours is a service brought to you by the Austrian tour operator City Tours, specialized in arranging tailor made holidays and sightseeing tours in Austria for groups and individual travellers. Hence, our full day Salzburg sightseeing tours can be organized not only from Munich, but also from other locations like Tyrol, Upper Austria, Lower Austria and Vienna. Also, we would be pleased to arrange tailor made sightseeing and panorama tours for groups and travellers staying in Salzburg itself.